io9 Halloween Costume Show Week 2: A Bungee-Jumping Buzz Lightyear, a Handmade Vampire Diaries Dress, and More! Welcome to the second week of io9's annual Halloween Costume Show! Last week, you guys knocked our fluffy animal slippers off with your incredible, creative costume show. Holy crap, are you all cosplaying geniuses? It was insanely hard to pick which ones to feature in our gallery this week. But luckily you can see every incredible, adorable costume from last week's show here. Show Us Your Best Imaginary Selves in io9&apos;s Annual Halloween Costume Show! Now it's time for you to post MOAR costume pictures, in comments below. Give us a sneak peek at what you're wearing this year, or show us glories from years past. Either way, we want to see it! You may only post pictures that have you in them. If you'd like to be included in next week's gallery, tell us a little about who you are and how you created the costume. Anblick does an amazing Soul Caliber IV scene. Auburnkt has won our hearts by creating this Katherine historical flashback costume from Vampire Diaries. Damon and Stefan's hearts are breaking right now. We're pretty sure that Julie Douberly's incredible Barnabus costume (complete with prosthetic finger-lengtheners!) is the only thing good to come out of the Tim Burton Dark Shadows remake. Say it with me: "Awwwwwww . . . " Mandrie, your family is adorable. Kickin it old school with Nuclearfish's robot. Sith Camaro outdid himself with this Loki costume. Sparkle-pipsi gives us a sumtuous, luminous take on Ysera from WOW. A simple but effective Zipperface from T-Bone214. 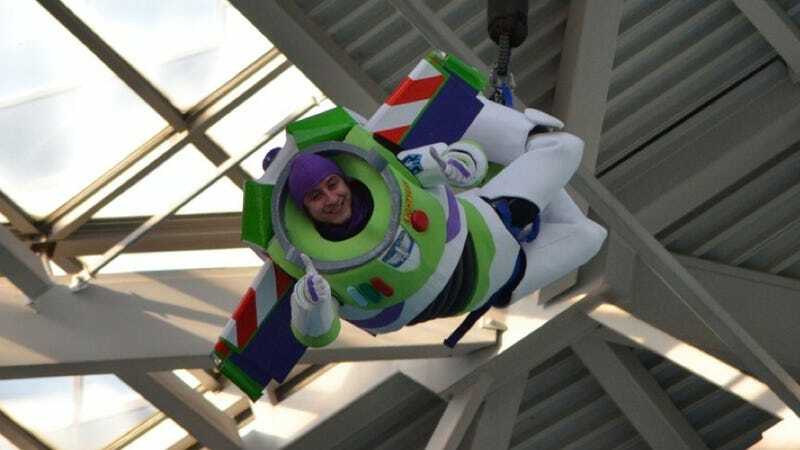 Because if you're going to wear a Buzz Lightyear costume that's this good, you might as well go bungee-jumping in it. Right, The_Gleib? This year he's going to go as a dinosaur, so we can only assume that next year he'll have pictures of himself being hit by a meteorite. How can we resist Wickley's take on the new TV version of Green Arrow? That's pop culture-influenced cosplay in real time.